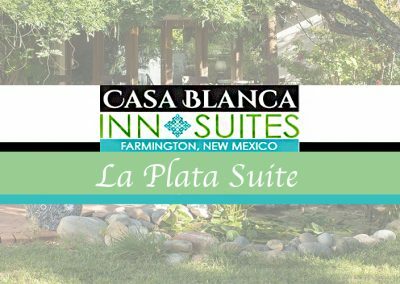 Casa Blanca Inn is your home for Farmington New Mexico extended stays. Let our professional staff do the housekeeping, gardening, and maintenance while you enjoy one of the most beautiful and historic properties in Farmington. In addition to your suite, casita or cottage, you can enjoy the inn’s gracious common areas and beautiful grounds. You can even arrange breakfast with advanced notice. The Casa Blanca Inn offers our business and executive travelers extremely convenient accommodations and concierge services for their long term stay. A beautiful selection of turn-key furnished private residences are offered for your comfort and productivity. Each accommodation is tastefully decorated in the Southwest style and beautifully appointed. 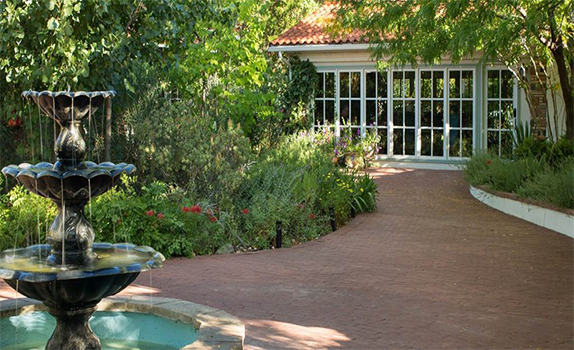 Outdoor spaces include wonderful gardens, fountains, ponds, patios and decks. Private laundry or laundry access is available with each unit. Each long term rental is fully furnished and includes weekly cleaning, all utilities, cable, and wifi. Rate ranges below are monthly and based on availability and do not include breakfast.